NEW YORK – November 10, 2016 – Who were the Marradians? Long forgotten, these ancient aliens profoundly shaped humanity’s evolution through inter-breeding and advanced science and technology. It’s a story that’s been suppressed – until now. The new book series Ancient Aliens: Marradians and Anunnaki from acclaimed exraterrestrial expert Ilil Arbel, Ph.D, and science fiction writer Gary Morgenstein will, for the very first time, reveal how the Marradians changed the course of mankind‘s history while battling their bitter rivals and cousins, the Anunnaki – with Earth the pawn in this galactic struggle. Arbel and Morgenstein will use ancient texts and new research to finally bring to life the history, culture, traditions, religion, politics, food, science, technology, songs, sexual practices and customs of this previously obscure alien race, who’ve been misnamed The Grays by global intelligence services to hide the extraterrestrials‘ existence. The first volume, Extraterrestrial Holidays, will teleport readers inside the worlds of the Marradians and Anunnaki through their holidays, from deity Cimric’s birthday, the Miracle of Egok the Cross-Limbed, the Sh‘ Holidays of Awe, as well as New Year’s and Breeding celebrations..
To blunt any attempts to subvert the truth, the authors are revealing select chapters before the official date of publication. The first selection, Ashar Marrad, about the Marradian day of thanks, will be available on November 15, 2016 at http://madmelsavestheworld.com/marradian-and-anunnaki-books/. ILIL ARBEL is the author of numerous fiction and non-fiction books, including factual biographies of alien hybrids (descendants of Anunnaki), as well as extensive research on both the Anunnaki and the Marradians. In addition to biographies, memoirs, novels, mythology/folklore, and metaphysics, Arbel has contributed numerous short stories and articles on the subjects of natural history, personal histories, biography, health, education, social commentaries, and Judaic myths to many publications. Arbel has a Ph.D. in liberal arts and has lived and studied in Tel Aviv, Paris, and New York. GARY MORGENSTEIN most recently wrote the critically acclaimed off-Broadway sci-fi rock musical The Anthem – Ayn Rand Meets Hunger Games. His plays range from A Tomato Can’t Grow in the Bronx and Right on Target to Ponzi Man, and his novels include Jesse’s Girl, under option to actress Ksenia Solo’s (Orphan Black) production company OnFireFilms, Loving Rabbi Thalia Kleinman, Take Me Out to the Ballgame and The Man Who Wanted to Play Center Field for the New York Yankees. He is currently completing the first novel in his science fiction trilogy, set on the eve of the 22nd Century after the United States lost World War Three. The popular sci-fi radio drama series, Mad Mel and the Marradians, is based on the stories of the Marradians and can be heard at madmelsavestheworld.com and iTunes. “Jaws 2: The Making of the Hollywood Sequel” Book on the Way! 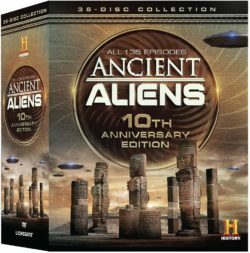 To celebrate the Gift Set for History’s “Ancient Aliens: The Complete Seasons 1-6” hitting DVD, we are happy to be giving one DVD of this amazing TV series. If you want to win one of these great prizes, please leave us a comment below or send us an email and tell us why you believe aliens are real? This giveaway will remain open until November 21th at Noon, Eastern Time. This is open to our readers in US and Canada only. One entry per person, per household. All other entries will be considered invalid. Media Mikes will randomly select winners. Winners will be alerted via email. From over 10,000 years of the most credible evidence unearthed, we’ll explore the ancient and mysterious, from sacred relics, artifacts and wall carvings to technologies, places and lore, all in a search for the humankind’s origins and even the secrets of the universe. New interpretations of ancient texts reveal new historical possibilities: Were ancient gods really aliens? Was Satan really humanity’s ally in the Bible? This groundbreaking HISTORY® series on H2® also uncovers the alien dimension within secret codes, deadly cults, mega-disasters and plagues; alien connections to dinosaurs, NASA and even the Third Reich; and considers time travel, underwater UFO activity, ancient martian civilizations, the possibility that some children have alien DNA — and if you can believe it, much more. Experience the trip of a lifetime (or many) in this mother of all gift sets. When it comes to learning about our past, I immediately think about The History Channel. They always deliver impressive programming and nice DVD releases. Though this release is not that impressive. Basically out of the 6 discs included, there are only two discs of new programs. “Planet Egypt” was produced in 2012 and contains four 45 minutes episodes. This four-part miniseries explores Egypt’s technology, culture, religion, wars and peace over 3,000 years. This is the star of the release and puts the others to shame. Luckily this release is very cheap running for under $17 dollars on Amazon and it is worth it just for these two discs. The rest of the extras are still informative and I will hold them as a bonus feature. Next up on disc 3 and 4 is dated back from 2001, “Egypt: Beyond the Pyramids”. This four-part series takes the viewers inside Egypt for (then) first-ever-filmed look into sites such as Tomb of Ramses II, the Abydos Boat Graves, and the skeletons at Mendes. Overall this series is decent but feels aged. Disc 5 includes “Egypt: Engineering an Empire” from 2006, which runs 90 minute. Decent and includes some good information. The sixth disc is basically the dumping ground from the rest of the old specials. “Ancient Egypt: Modern Medicine” is the worst quality of the three but has this certain vintage charm. “Egypt’s Great Queen” delivers some interesting information about Hatshepsut. “The Great Pyramids of Giza and Other Pyramids” is the oldest dating back to 1997. Lastly, we have the aging special “Ramses’ Egyptian Empire”. Official Premise: From its unification in approximately 3100 B.C. to its conquest by Alexander the Great in 332 B.C., ancient Egypt was the preeminent civilization in the Mediterranean world. This special 6-disc collectible set headlined by HISTORYs best-selling programs; including the acclaimed Egypt-focused episode of the Emmy®-winning series ENGINEERING AN EMPIRE, and the highly-rated mini-series PLANET EGYPT, THE ANCIENT EGYPT ANTHOLOGY pays homage to this rich and complex culture and explores it from its very beginnings as a land of disparate peoples, through its dynastic zenith and to its ultimate decline.